I love this card, no really, I LOVE this card. I hope you agree! I’m especially glad I love it because I know the couple I gave it to keep my cards out on display for months and even years! Sweet huh? Hubby took this photo for me thus the different angle than I usually take pictures from. I volunteered to make this card for a group to sign but forgot to make it until the last minute so the second I finished it, I rushed upstairs to quickly shower so we could get going out. Everything else about it is fine though so it’s all good. 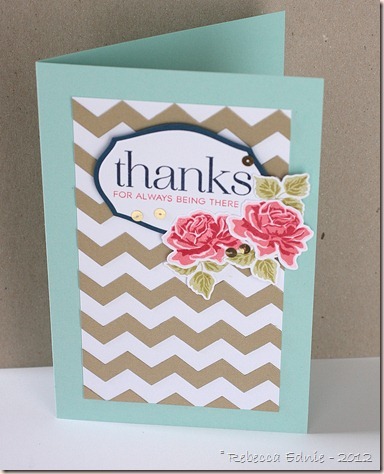 I CASEd a card by Nichole Heady for the metallic chevron base. Sorry but I don’t have a link handy. After that, my card differs a lot. I was inspired also by the CAS-ual Fridays 97 challenge to use chevrons and flowers. This is a colour combo I’ve seen lately but have never used myself and really like. I credit Dawn McVey for making me brave enough to layer coral with red for the flowers! It always looks great when she does it. Paper: aqua mist, white, enchanted evening-PTI, gold CS-SU! Ink: berry sorbet, moss, chartreuse-PTI, navy, red, pink pirouette-SU! this is so pretty! love the colors you used. beautiful card! thanks for joining us this week at CAS-ual Fridays CHallenge! Wow! The flowers look unbelievable! I love the metallic chevrons, too. I can see why you love the card so much–it's awesome! The flowers are just so so so beautiful ❤ Thanks so much for joining us at CAS-ual Friday Challenge! Very lovely! I am crazy for chevrons and love your colors combination,very pretty!